We saw just the pop of color to make our garden even sweeter. 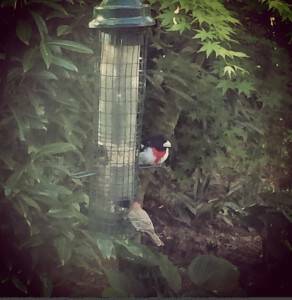 Here’s a photo of a rose-breasted grosbeak and a purple house finch at the feeder…heaven! How can you attract your favorite types of birds and butterflies to your garden? Listen in to expert Glenda Zahner who teaches us how to plan to support wildlife. Got Instagram? Don’t forget to follow us by clicking here.